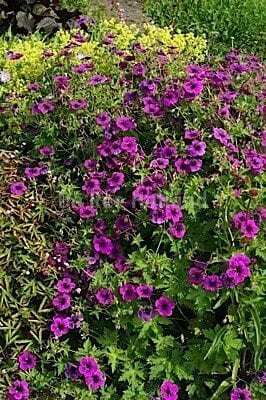 A new introduction from Alan Bremner in the Orkney Islands and comes from viable seed of Geranium ‘Anne Thomson’. It produces large magenta, saucer-shaped flowers with black centres and the plant is very floriferous. The deeply divided leaves are mound forming and this makes an excellent hybrid for the front of a border, banks or over walls, whilst also being suitable for containers. Flowers continuously throughout the summer. Cut back all foliage to the ground in spring. Propagate by root or stem cuttings. A new variety, but as yet has not set any seed for us.